Karpathos, the second largest island of the Dodecanese chain, lies between Rhodes and Crete. Its rather rectangular in shape and its terrain is mountainous, the highest peak being Kali Limmi at 1214 metres above sea level . Karpathos is a Greek Island rich in culture and traditions, beautifully mountainous in the north part and fertile in the south with many fantastic beaches with crystal clear waters. It is an island still keeping a lot of old Greek fashion, with women at the picturesque mountainous villages still dressed in their traditional wear and baking bread in outdoor ovens. The island counts twelve villages, seven of them being in the mountains, counting in total about 6500 inhabitants. Because the island is located between Africa and Europe, many migratory birds chose this place to rest in its woods or marshes, on their way to northern countries. During the summer many traditional festivals take place. The participants, old and young, create together with folk dances a wonderful mixture of colours and melodies. 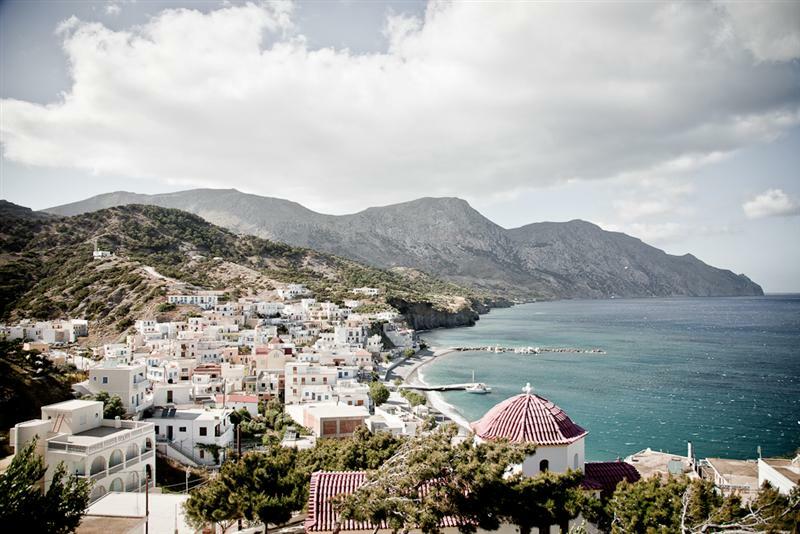 The modern town of Pigadia at the south-east end of the island, the capital and the main port of Karpathos, is the first thing you see as the boat enters into the beautiful harbor. It gathers a population of about 3500 inhabitants and has been built amphitheatrically around the natural port. On the left side of the entrance dominates a rock where the ruins of the ancient acropolis of the island can be seen. Many small shops, restaurants, taverns and cafés are situated around the harbor, hotels and apartments following the long sandy beach which stretches out to the north. The narrow alleys and the beautiful houses with their red tiled roofs and balconies make Pigadia a very attractive place which charms everyone who first arrives on Karpathos.